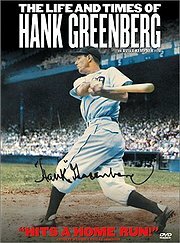 The Life and Times of Hank Greenberg (1998) is a documentary telling the story of Hall of Fame first baseman Hank Greenberg. Writer and director Aviva Kempner used interviews with Greenberg during the last year of his life, interviews with friends and family, as well as extensive archival footage and stills to tell the story. She also used interviews with fans to great effect. It’s a baseball story, of course, and there is plenty for a fan to enjoy. Greenberg was a genuine star, a Hall of Famer who in 1938 came close to breaking Babe Ruth‘s home run record. Greenberg is still the record holder for RBI’s (runs batted in) in a single season by a right-handed batter (1938). Strictly as a sports biography, this is a rich and satisfying little film. Kempner delved into the wider significance of Greenberg’s career as the first American Jewish sports superstar. Even though he was personally not a “religious” Jew, his Jewish identity was an important symbol for many fans, both Jewish and non-Jewish. The film details the anti-Semitism he faced, and the adoration of many Jewish fans. It goes into some detail over his famous decision in 1934 to stay away from a World Series game held on Yom Kippur, instead attending synagogue services. This big, tall, handsome Jewish sports star played for the Tigers in the city of Detroit, home base for prominent American anti-Semites Henry Ford and Father Coughlin. Greenberg began his career just as the Nazi persecution of the Jews in Europe became German policy. His presence and play flew in the face of anti-Semitic stereotypes. Kempner used clips from other films like Gentleman’s Agreement to illustrate the atmosphere in America at the time. 1. Hank Greenberg believed he had responsibilities as a role model for young fans, and as a Jew in the public eye. Do you think that a public figure has such responsibilities? Does every Jew in the public eye need to represent “the Jews”? Why or why not? 2. Many things about professional sports have changed since Greenberg’s day, and some things have not changed at all. Ballplayers can become “free agents” and make much more money than they used to. What other things are different about pro sports then and now? What’s the same? This entry was posted in United States and tagged American Jewish History, Anti-Semitism, Jewish Identity, Sports. Bookmark the permalink.